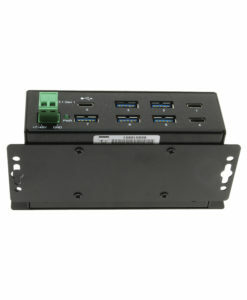 10 Port USB 2.0 Charger with Built-in 4 Port Hub. Simultaneously charge mobile devices and access data from the same place. USB AC Charger plus 4 port data hub. Can charge 10 individual devices at one time. Designed with a built-in power adapter for its 60 watts of power. Includes Data Cable USB Type-A Male to Micro-B Male. This is a Compact yet sturdy and practical USB charger that measures 6.5 x 4.25 x 1.25 and weights only 12oz., the 10 port USB charger hub packs a lot of function for your charging needs into one place. 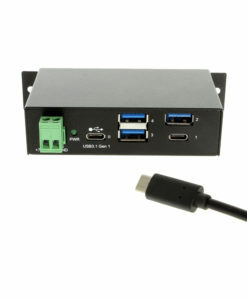 This Unique universal USB 60W AC charger powers 10-Ports with up to 1A per port when using all 10 ports and 2.4A of power per port when using only 5 ports. This USB charger features Sleek Curves and a low-profile, Built-in Power Adapter, portable design and comes with durable ABS casing. Devices charging at the same time could be; iPad, iPhone, Galaxy S4, Nexus 7, and more.